Grandma Gatewood's Walk by Ben Montgomery was an interesting tale of one woman's determination and journey as she in 1995 became the first woman to through-hike the entire 2,050 miles of the Appalachian Trail from Georgia to Maine. 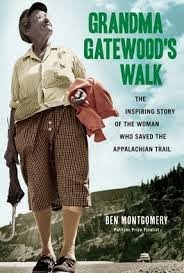 The story of Emma Gatewood was a compelling one with her raising 11 children while enduring an abusive husband, leaving him, and then after her children were grown taking off on her own and doing the AT hike at the age of 67. Then two years later, she hiked the trail again, later hiked the general path of the Oregon Trail from Missouri to Oregon and in 1964 did the Appalachian Trail for a third time. Also interesting was mention of how heavily she was followed by the national media as word of her hike began to spread, and then towards the very end of the book, Montgomery wrote of meeting on the top of Mount Katahdin in Maine through-hikers who cited Gatewood as an inspiration. The read for me did get to be slow going at times, but I think that was due simply to the less than glamorous subject and the book built up to solid meaning with (among other things) the idea that it's never too late for someone to do what they want to do and turn themselves into something they weren't previously. I waited until completing the book to read it, but also found interesting Montgomery's piece for Nieman Storyboard on writing the book.